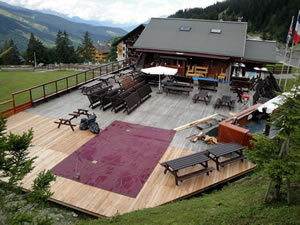 Three Valleys Transfers & Pub Le Ski Lodge for the updates and pics throughout the Summer. 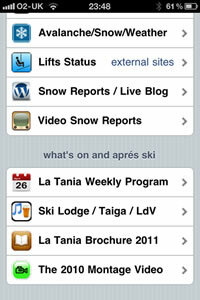 The New La Tania Mobile iPhone App at m.latania.co.uk FREE! 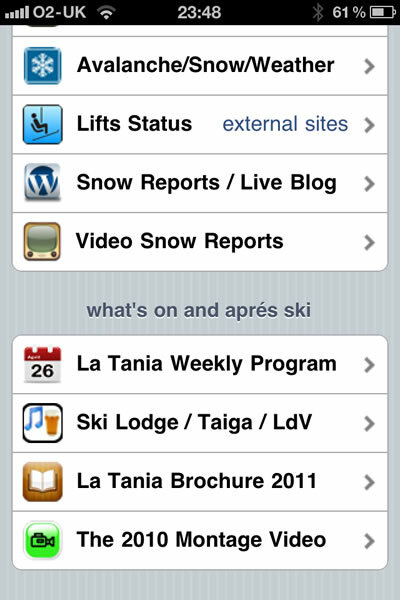 This is a WebApp with fast off-line access to essential information, piste maps, phone numbers, bus times and last lifts without the rip off roaming data charges. Plus a host of links to live information, weather, snow reports, what's on, Aprés guide and web cams. La Tania is 20 years old this Winter and celebrations and fireworks are planned on 22 December 2010 and 23 February 2011. You can also ski for free on your 20th birthday this season - one day in the Courchevel Valley and proof required of course! Every Saturday this winter you can benefit from a reduction of 10€ on the 3 Vallées pass (37€ instead of 47€). Available only when you buy your ski pass online. There is also the Liberty Pass which works like a pay as you go pass deducting the skiing direct from your bank account as you first use it on a days skiing and the Three Hour pass instead of an afternoon or morning only pass. A new Val Thorens beginners area pass is now available and special promotions will apply on 21 December 2010 in Courchevel when the Ladies World Cup Slalom is hosted above 1850. The Emile Allais stadium slope, on which the race will take place, has been improved and remodeled. 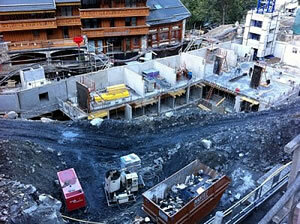 Work on the new Public Building in La Tania was started the day after the lifts shut in April 2010. The building will have an emergency Medical Centre with Ambulance access, a new creche opening in Feb 2011, a left luggage office, public toilets and a local Police office plus a community room for meetings, exhibitions etc. 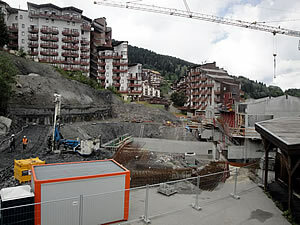 There are also 4 or 5 apartments for the Commune seasonal workers and 15 covered car parking spaces (under the piste!). The roof was being completed during October 2010 so should be open in time for Winter. Across the piste from here next to the drag lift is a new linked apartment complex which will be completed next season. 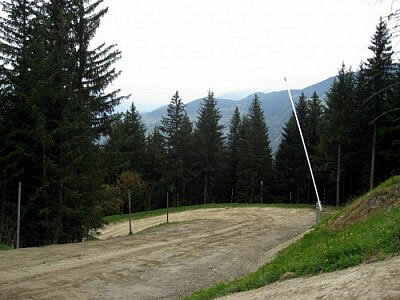 A new beginners area at the top of the La Tania Gondola has been created. This will have a "Magic Carpet" travelator type lift system to make it easy for beginners to travel back up the gentle open slope. A new controlled, safe sledging area is also to be hosted in this area. 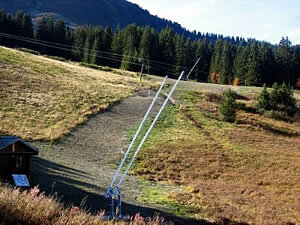 New snow cannons have been installed along the entire length of the La Tania green resort run. 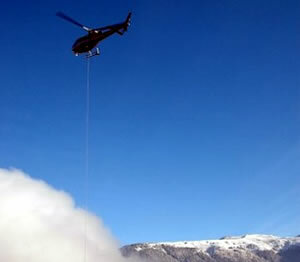 This should guarantee this way to ski home to resort for most of the season whatever the natural snow conditions are. This new equipment moves the total number of snow cannons in the Courchevel Valley to 637, which means that 44% of the ski area is equipped. The Freeride Competition Returns. After the successful inauguration edition of the Valkyrie Fest in March 2010, the freeride event enters the infamous Freeride World Tour as a FWQ event, named Ride The Rock. Expect top Freeride skiers and boarders performing some amazing lines down the steep chutes on Rocher de la Loze high above La Tania in March next year. Le Praz sees a new bar this season. The Drop Inn bar located at Chalet Merisiers will be open in December run by our friends from Pleisure Holidays. The double cannon pictured left is a rarity in the Three Valleys - shows the commitment to creating snow in this area of the green run. There's also been some re-grading of the green run to make it easier for beginners and across the whole ski area there's been improvement to signage, safety barriers, avalanche control plus lots of work on erosion prevention and improved drainage. Over in Courchevel there have improvements and re-modeling of the Family Fun Park area near the Biollay lift area. 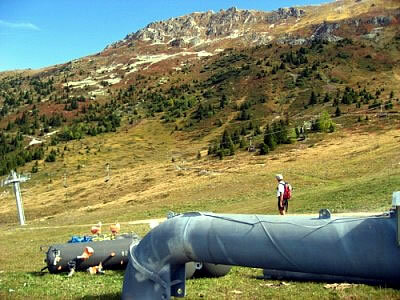 The Boulevard de Loze running down to Méribel from the top of Col de la Loze above La Tania is to have new Gazex avalanche control systems installed. These are the remote controlled "tubes" that blast out compressed gas to set off controlled avalanche and prevent a build up of a dangerous amount of snow in certain areas. The Boulevard was closed in late afternoon several times last season as the sun got to work and made the route hazardous. The Christiana apartments have been refurbished and new apartment roofs have meant lots of helicopters flying around La Tania this Summer (the rest of the cranes were in Méribel and Courchevel). More chalets towards the red run have been completed taking the total number in La Tania to over 100. 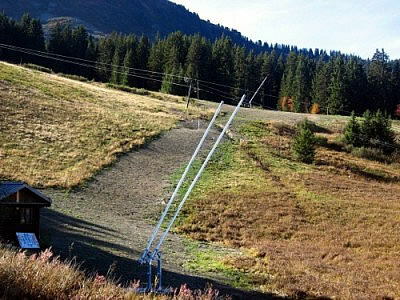 No more Snowline chalets in La Tania from this season, we're safe from those Landrovers! Also sadly, Essentially Alpine have moved on to the Aravis area in the Northern Alps. New businesses include Dazzle Transfers, 3V Ramonage Chimney Sweeps, Snow Bugs child care and John & Blossom Ski Catered Chalet and Ski Class ski school. The Michelin starred Le Farcon restaurant in La Tania will be introducing kids to the world of gastronomic food with special promotions this Winter. Pictured is a new extension to the Terrace at the Rond Point over in Méribel This will help manage the crowds at The Little World Festival 2011 with the free open air gig on the piste adjacent. This takes place from 12-19 March 2011 - note there will be no Méribel Altitude Festival in 2011. On the piste above the Ronnie a new upstairs terrace on the Restaurant La Coers De Crystal has been built. A large new terrace and landscaping outside Lodge du Village over in Méribel Village is planned too. Méribel has been cut in two this Summer as initial work on a 5 star hotel (not due to open until Dec 2011) has dug up the whole main road down from The Tav to the Cap. All the underground car park and building work is being completed before relaying the road by this Winter. Loads of cranes building another large hotel on the road in to 1850 too. The K2 Complex has took up some more forest and spoiling some of the views on the beautiful Cospilot run down from 1850 to 1550 (and for some of those amazing chalets too). There are now 12 five star hotels located in Courchevel 1850. Also in and around the Méribel Valley: The Cote Brune chair lift at the top of the valley that links over to Val Thorens has been upgraded to support an extra 15% capacity per hour. Installation of 400 metres of snow fences (on the the Campagnol and Venturon pistes). This is an ecological way of accumulating snow on the pistes, thanks to the wind. Snow fences have been used successfully for many years in Méribel-Mottaret (and are used massively in the 5 Scottish ski areas to excellent effect). Improvements made to the middle section of the Lac de la Chambre piste (coming back from Val Thorens) making it a more enjoyable run. A new kids nature trail / piste in the Altiport forest has been created along with a new peaceful beginner s piste at the top of the Altiport lift called Cool Moon and Acticross, a family friendly skier cross run. The Doron beginners area has also been improved. The Méribel Moon Park, Plattieres Snow Park and Courchevel Family Fun Park areas have all been improved and re-modeled. L’Adray Télébar in Méribel is getting bigger thanks to three new lodges. 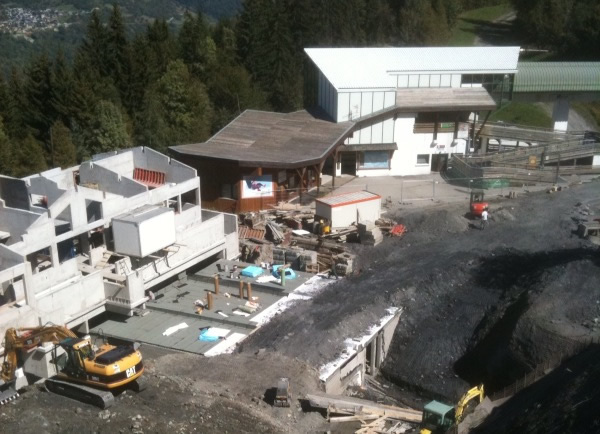 Building Work in La Tania - Finished for Winter! Thanks to the new blue run, L’Eterlou, beginners can now make their way safely to the Grand Fond Funitel. 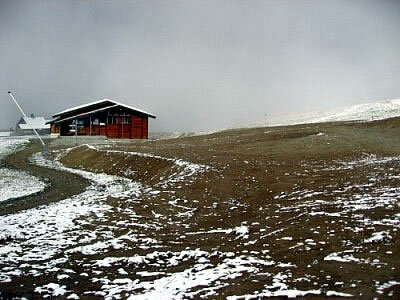 The free easy ski area has 2 new green runs: Musaraigne and Campagnols. The first is virtually flat for those just finding their feet on the slopes and the second is z shaped for those making their first turns. A new red run, Les Chardons, built on the PleinSud area provides an alternative to the existing blue runs and allows access to a new picnic site located at an altitude of 2,700 metres. Also in VT there are new panoramic cabins on the Cime Caron cable car, major improvements to the Slalom Stadium and re-modelled fun parks and upgrades to the toboggan runs. The St Martin Tourist Office has been completely refurbished and won an environmental award for the building. They've a new web site too and Quad biking on ice to be offered in St Martin this Winter. The Les Bruyères area now has a totally new blue beginner's piste called Gaston's. A real beginner's itinerary situated at the top of the resort near Reberty 1850 and leading down to the Bruyères quarter. In addition, there is also a new free moving carpet for first timer beginners. The hotel Les Bruyères, situated in Les Menuires is "the first carbon neutral" hotel in Les Menuires. It has been bought by the Temmos Group whose aim is to obtain European Ecolabel awards for all the group's hotels by the end of 2010, by reducing the consumption of energy and water, volume of waste, the emissions of greenhouse gases and to use, as much as possible, local and seasonal products in each of their restaurants. Upgrades and improvements to their freestyle, skier/boarder cross and fun parks too. Even more low cost this winter! This year, our ski village is pushing back the low cost limits by creating 'low cost Wednesdays'. Restaurants, bars, affiliate shops... will all be offering a low cost menu, cocktail or treatment every Wednesday, from 17th December 2010 to 17th April 2011. Low cost and Brides les Bains quite simply go hand in hand!